"Brasilia" redirects here. For other uses, see Brasilia (disambiguation). From the top, clockwise: Monumental Axis seen from the TV Tower; Metropolitan Cathedral at night; facade of the Alvorada Palace; Juscelino Kubitschek bridge in Paranoá Lake; buildings of the South Banking Sector and the National Congress building with the national mast in the Three Powers Plaza at the background. Brasília was planned and developed by Lúcio Costa, Oscar Niemeyer and Joaquim Cardozo in 1956 to move the capital from Rio de Janeiro to a more central location. The landscape architect was Roberto Burle Marx. The city's design divides it into numbered blocks as well as sectors for specified activities, such as the Hotel Sector, the Banking Sector and the Embassy Sector. Brasília was chosen as a UNESCO World Heritage Site due to its modernist architecture and uniquely artistic urban planning. It has also been named "City of Design" by UNESCO in October 2017 and has been part of the Creative Cities Network since then. All three branches of Brazil's federal government are centered in the city: executive, legislative, and judiciary. Brasília also hosts 124 foreign embassies. The city's international airport connects it to all other major Brazilian cities and many international destinations, and is the third busiest airport in Brazil. Brasília is the most populous Portuguese-speaking capital city. It was one of the main host cities of the 2014 FIFA World Cup and hosted some of the football matches during the 2016 Summer Olympic Games; it also hosted the 2013 FIFA Confederations Cup. 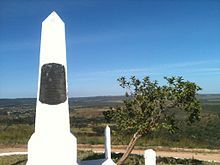 The foundation stone of Brasília, Hill of the Centenary, erected in the year of the celebrations of the 100 years of the independence of Brazil in 1922. Sketch of the city of Vera Cruz done by the Commission of Location of the New Federal Capital in 1954. In 1955 Juscelino Kubitschek was elected president of Brazil. Upon taking office in January, 1956, in response to his campaign pledge, he initiated the planning and construction of the new capital. In 1957 an international jury selected Lúcio Costa's plan to guide the construction of Brazil’s new capital, Brasília. Costa's plan was not as detailed as some of the plans presented by other architects and city planners. It did not include land use schedules, models, population charts or mechanical drawings, however, it was chosen by five out of six jurors because it had the features required to align the growth of a capital city Even though the initial plan was transformed over time, his plan oriented much of the construction and most of its features survived. Brasília's accession as the new capital and its designation for the development of an extensive interior region inspired the symbolism of the plan. Costa used a cross-axial design indicating the possession and conquest of this new place with a cross often described by some as a dragonfly, an airplane or a bird. Costa's plan included two principal components, the Monumental Axis (east to west) and the Residential Axis (north to south). The Monumental Axis was assigned political and administrative activities and is considered the body of the city with the style and simplicity of its buildings, oversized scales, and broad vistas and heights, producing the idea of Monumentality. This axis includes the various ministries, national congress, presidential palace, supreme court building and the television and radio tower. The Residential Axis was intended to contain areas with intimate character and is considered the most important achievement of the plan; it was designed for housing and associated functions such as local commerce, schooling, recreations and churches, constituted of 96 superblocks [pt] limited to six stories buildings and 12 additional superblocks limited to three stories buildings; Costa's intention with superblocks was to have small self-contained and self-sufficient neighborhoods and uniform buildings with apartments of two or three different categories, where he envisioned the integration of upper and middle classes sharing the same residential area. The urban design of the communal apartment blocks was based on Le Corbusier's Ville Radieuse of 1935 and the superblocks on the North American Radburn layout from 1929. Visually, the blocks were intended to appear absorbed by the landscape because they were isolated by a belt of tall trees and lower vegetation. 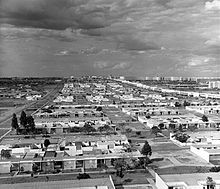 Costa attempted to introduce a Brazil that was more equitable, he also designed housing for the working classes that was separated from the upper and middle-class housing and was visually different, with the intention of avoiding slums (favelas) in the urban periphery. The superquadra has been accused of being a space where individuals are oppressed and alienated to a form of spatial segregation. An interesting analysis can be made of Brasília within the context of Cold War politics and the association of Lúcio Costa's plan to the symbolism of aviation. From an architectural perspective, the airplane-shaped plan was certainly an homage to Le Corbusier and his enchantment with the aircraft as an architectural masterpiece. However, it is important to also note that Brasilia was constructed soon after the end of World War II. Despite Brazil's minor participation in the conflict, the airplane shape of the city was key in envisioning the country as part of the newly globalized world, together with the victorious Allies. Furthermore, Brasília is a unique example of modernism both as a guideline for architectural design but also as a principle for organizing society. Modernism in Brasília is explored in James Holston's book, The Modernist City. Juscelino Kubitschek, President of Brazil from 1956 to 1961, ordered Brasília's construction, fulfilling the promise of the Constitution and his own political campaign promise. Building Brasília was part of Juscelino's "fifty years of prosperity in five" plan. Already in 1892, the astronomer Louis Cruls, in the service of the Brazilian government, had investigated the site for the future capital. Lúcio Costa won a contest and was the main urban planner in 1957, with 5550 people competing. Oscar Niemeyer, a close friend, was the chief architect of most public buildings, Joaquim Cardozo was the structural engineer, and Roberto Burle Marx was the landscape designer. Brasília was built in 41 months, from 1956 to April 21, 1960, when it was officially inaugurated. The city is located at the top of the Brazilian highlands in the country's center-western region. The Paranoá Lake is a large artificial lake that was built to increase the amount of water available and to maintain the region's humidity. It has Brazil's second largest marina, and hosts wakeboarders and windsurfers. Diving can also be practiced and one of the main attractions is Vila Amaury, an old village submerged in the lake. This is where the first construction workers of Brasília used to live. According to the 2010 IBGE Census, there were 2,469,489 people residing in Brasília and its metropolitan area, of which 1,239,882 were Pardo (multiracial) (48.2%), 1,084,418 White (42.2%), 198,072 Black (7.7%), 41,522 Asian (1.6%), and 6,128 Amerindian (0.2%). In the 1960 census there were almost 140,000 residents in the new Federal District. By 1970 this figure had grown to 537,000. By 2010 the population of the Federal District had surpassed 2,5 million. The city of Brasília proper, the plano piloto was planned for about 500,000 inhabitants, figure the plano piloto never surpassed, the current population is only 214,529, but its metropolitan area within the Federal DIstrict has grown past this figure. From the beginning, the growth of Brasília was greater than original estimates. According to the original plans, Brasília would be a city for government authorities and staff. However, during the construction period, Brazilians from all over the country migrated to the satellties cities of Brasília, seeking public and private jobs. Christianity, in general, is by far the most prevalent religion in Brazil with Roman Catholicism being the largest denomination. Brasília does not have mayor and councillors, because the article 32 of the 1988 Brazilian Constitution expressly prohibits that the Federal District be divided in municipalities, being considered one. 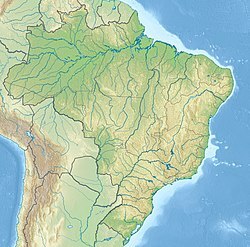 The Federal District is a legal entity of internal public law, which is part of the political-administrative structure of Brazil of nature sui generis, because it is neither a state nor a municipality, but rather a special entity that accumulates the legislative powers reserved to the states and municipalities, as provided in art. 32, § 1º of the CF, which gives it a hybrid nature of state and municipality. The executive power of the Federal District was represented by the mayor of the Federal District until 1969, when the position was transformed into governor of the Federal District. The legislative power of the Federal District is represented by the Legislative Chamber of the Federal District, whose nomenclature represents a mixture of legislative assembly (legislative power of the other units of the federation) and of municipal chamber (legislative of the municipalities). The Legislative Chamber is made up of 24 district deputies. The judicial power which serves the Federal District also serves federal territories. 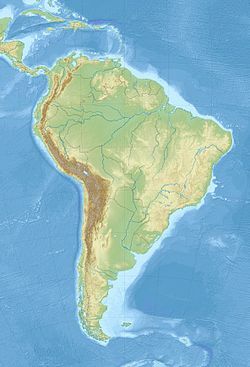 Brazil does not have territories currently, therefore, the Court of Justice of the Federal District and of the Territories only serves the Federal District. Part of the budget of the Federal District Government comes from the Constitutional Fund of the Federal District. In 2012, the fund totaled 9.6 billion reais. By 2015, the forecast is 12.4 billion reais, of which more than half (6.4 billion) is spent on public security spending. Industries in the city include construction (Paulo Octavio, Via Construções, and Irmãos Gravia among others); food processing (Perdigão, Sadia); furniture making; recycling (Novo Rio, Rexam, Latasa and others); pharmaceuticals (União Química); and graphic industries. The main agricultural products produced in the city are coffee, guavas, strawberries, oranges, lemons, papayas, soybeans, and mangoes. It has over 110,000 cows and it exports wood products worldwide. The city is also the birthplace of Brazilian rock and place of origin of many bands like: Legião Urbana, Capital Inicial, Aborto Elétrico, Plebe Rude and Raimundos. Currently Brasília has the Rock Basement Festival which attempts to bring new bands to the national scene. The festival is held in the parking Brasilia National Stadium Mané Garrincha. Brasília has also been the focus of modern-day literature. Published in 2008, The World In Grey: Dom Bosco's Prophecy, by author Ryan J. Lucero, tells an apocalyptical story based on the famous prophecy from the late 19th century by the Italian saint Don Bosco. According to Don Bosco's prophecy: "Between parallels 15 and 20, around a lake which shall be formed; A great civilization will thrive, and that will be the Promised Land". Brasília lies between the parallels 15° S and 20° S, where an artificial lake (Paranoá Lake) was formed. Don Bosco is Brasília's patron saint. Aerial view of downtown Brasília (Pilot Plan) along the Monumental Axis, especially the new Mane Garrincha Stadium (left), the National Congress and the Three Powers Plaza (right). The entire residential area of North Wing (Asa Norte) is seen in the middle of the image. These and other major structures were designed by Brazilian architect Oscar Niemeyer and projected by Brazilian structural engineer Joaquim Cardozo in the style of modern Brazilian architecture. In the Square of Three Powers, he created as a focal point the dramatic Congressional Palace, which is composed of five parts: twin administrative towers flanked by a large, white concrete dome (the meeting place of the Senate) and by an equally massive concrete bowl (the Chamber of Deputies), which is joined to the dome by an underlying, flat-roofed building. The Congress also occupies various other surrounding buildings, some connected by tunnels. A series of low-lying annexes (largely hidden) flank both ends. Farther east, on a triangle of land jutting into the lake, is the Palace of the Dawn (Palácio da Alvorada; the presidential residence). Between the federal and civic buildings on the Monumental Axis is the Cathedral of Brasilia, considered by many to be Niemeyer's and Cardozo's finest achievement (see photographs of the interior). The parabolically shaped structure is characterized by its 16 gracefully curving supports, which join in a circle 115 feet (35 meters) above the floor of the nave; stretched between the supports are translucent walls of tinted glass. The nave is entered via a subterranean passage rather than conventional doorways. Other notable buildings are Buriti Palace, Itamaraty Palace, the National Theater, and several foreign embassies that creatively embody features of their national architecture. The Brazilian landscape architect Roberto Burle Marx designed landmark modernist gardens for some of the principal buildings. After a visit to Brasília, the French writer Simone de Beauvoir complained that all of its superquadras exuded "the same air of elegant monotony", and other observers have equated the city's large open lawns, plazas, and fields to wastelands. As the city has matured, some of these have gained adornments, and many have been improved by landscaping, giving some observers a sense of "humanized" spaciousness. Although not fully accomplished, the "Brasília utopia" has produced a city of relatively high quality of life, in which the citizens live in forested areas with sporting and leisure structure (the superquadras) flanked by small commercial areas, bookstores and cafés; the city is famous for its cuisine and efficiency of transit. Nothing dates faster than people's fantasies about the future. This is what you get when perfectly decent, intelligent, and talented men start thinking in terms of space rather than place; and single rather than multiple meanings. It's what you get when you design for political aspirations rather than real human needs. You get miles of jerry-built platonic nowhere infested with Volkswagens. This, one may fervently hope, is the last experiment of its kind. The utopian buck stops here. 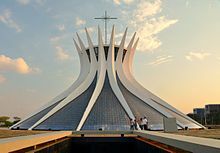 The Cathedral of Brasília in the capital of the Federative Republic of Brazil, is an expression of the atheist architect Oscar Niemeyer and the structural engineer Joaquim Cardozo. This concrete-framed hyperboloid structure, seems with its glass roof reaching up, open, to the heavens. On May 31, 1970, the Cathedral's structure was finished, and only the 70 m (229.66 ft) diameter of the circular area were visible. Niemeyer's and Cardozo's project of Cathedral of Brasília is based in the hyperboloid of revolution which sections are asymmetric. The hyperboloid structure itself is a result of 16 identical assembled concrete columns. There is controversy as to what these columns, having hyperbolic section and weighing 90 t, represent, some say they are two hands moving upwards to heaven, others associate it to the chalice Jesus used in the last supper and some claim it represent his crown of thorns. The Cathedral was dedicated on May 31, 1970. The Palácio do Planalto is the official workplace of the president of Brazil. It is located at the Praça dos Três Poderes in Brasília. As the seat of government, the term "Planalto" is often used as a metonym for the executive branch of government. The main working office of the President of the Republic is in the Palácio do Planalto. The President and his or her family do not live in it, rather in the official residence, the Palácio da Alvorada. Besides the President, senior advisors also have offices in the "Planalto", including the Vice-President of Brazil and the Chief of Staff. The other Ministries are along the Esplanada dos Ministérios. The architect of the Palácio do Planalto was Oscar Niemeyer, creator of most of the important buildings in Brasília. The idea was to project an image of simplicity and modernity using fine lines and waves to compose the columns and exterior structures. The Palace is four stories high, and has an area of 36,000 m2. Four other adjacent buildings are also part of the complex. Portuguese is the official national language and the primary language taught in schools. English and Spanish are also part of the official curriculum. The city has six international schools: American School of Brasília, Brasília International School (BIS), Escola das Nações, Swiss International School (SIS), Lycée français François-Mitterrand (LfFM) and Maple Bear Canadian School. August 2016 will see the opening of a new international school – The British School of Brasilia. Brasília has two universities, three university centers, and many private colleges. This makes for a large number of takeoffs and landings and it is not unusual for flights to be delayed in the holding pattern before landing. Following the airport's master plan, Infraero built a second runway, which was finished in 2006. In 2007, the airport handled 11,119,872 passengers. 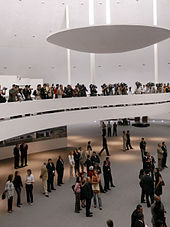 The main building's third floor, with 12 thousand square meters, has a panoramic deck, a food court, shops, four movie theatres with total capacity of 500 people, and space for exhibitions. Brasília Airport has 136 vendor spaces. The airport is located about 11 km (6.8 mi) from the central area of Brasília, outside the metro system. The area outside the airport's main gate is lined with taxis as well as several bus line services that connect the airport to Brasília's central district. The parking lot accommodates 1,200 cars. The airport is serviced by domestic and regional airlines (TAM, GOL, Azul, WebJET, Trip and Avianca), in addition to a number of international carriers. In 2012, Brasília's International Airport was won by the InfraAmerica consortium, formed by the Brazilian engineering company ENGEVIX and the Argentine Corporacion America holding company, with a 50% stake each. During the 25-year concession, the airport may be expanded to up to 40 million passengers a year. In 2014 the airport received 15 new boarding bridges, totaling 28 in all. This was the main requirement made by the federal government, which transferred the operation of the terminal to the Inframerica Group after an auction. The group invested R$750 million in the project. In the same year, the number of parking spaces doubled, reaching three thousand. The airport's entrance have a new rooftop cover and a new access road. Furthermore, a VIP room was created on Terminal 1's third floor. The investments resulted an increase the capacity of Brasília's airport from approximately 15 million passengers per year to 21 million by 2014. Brasília has direct flights to all states of Brazil and direct international flights to Buenos Aires, Lisbon, Miami, Orlando and Panama City. It consists of three 60 m (200 ft) tall asymmetrical steel arches that crisscross diagonally. With a length of 1,200 m (0.75 miles), it was completed in 2002 at a cost of US$56.8 million. The bridge has a pedestrian walkway and is accessible to bicyclists and skaters. The Brasília Metro is Brasília's underground metro system. The system has 24 stations on two lines, the Orange and Green lines, along a total network of 42 km (26 mi), covering some of the metropolitan area. Both lines begin at the Central Station and run parallel until the Águas Claras Station. The Brasília metro is not comprehensive so buses may provide better access to the center. The main bus hub in Brasília is the Central Bus Station, located in the crossing of the Eixo Monumental and the Eixão, about 2 km (1.2 mi) from the Three Powers Plaza. The original plan was to have a bus station as near as possible to every corner of Brasília. Today, the bus station is the hub of urban buses only, some running within Brasília and others connecting Brasília to the satellite cities. The average amount of time people spend commuting with public transit in Brasília, for example to and from work, on a weekday is 96 min. 31% of public transit riders, ride for more than 2 hours every day. The average amount of time people wait at a stop or station for public transit is 28 min, while 61% of riders wait for over 20 minutes on average every day. The average distance people usually ride in a single trip with public transit is 15.1 km (9.4 mi), while 50% travel for over 12 km (7.5 mi) in a single direction. 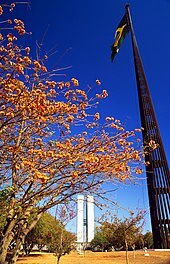 ^ a b c IBGE: Brasília Archived October 17, 2013, at the Wayback Machine IBGE. Retrieved on February 21, 2016. (in Portuguese). ^ "Estimativa Populacional 2013" (PDF). Pesquisa Demográfica por Amostra de Domicílios 2011 (in Portuguese). Codeplan. November 9, 2012. Archived from the original (PDF) on September 3, 2015. Retrieved June 6, 2015. ^ Istrate, Emilia. "Global MetroMonitor | Brookings Institution". Brookings.edu. Archived from the original on June 4, 2013. Retrieved February 25, 2014. ^ "Niemeyer e Joaquim Cardozo: uma parceria mágica entre arquiteto e engenheiro" (in Portuguese). Brazil Communication Company. 2012. Retrieved 7 January 2019. ^ "Brasília 50 anos" (PDF) (in Portuguese). Veja. 2009. Retrieved 7 January 2019. ^ "World Heritage List". Unesco. Retrieved February 6, 2013. ^ "The Brazilian cities Brasília, Paraty and João Pessoa join the UNESCO Creative Cities Network". www.unesco.org. United Nations Educational, Scientific and Cultural Organization. Retrieved 2018-10-03. ^ "Lista do Corpo Diplomático e Organismos Internacionais". Cerimonial, Ministério das Relações Exteriores. Archived from the original on August 7, 2011. Retrieved August 18, 2011. ^ Epstein, David G. (1980). "Brasília, Plan and Reality: A Study of Planned and Spontaneous Urban Development". University of New Mexico Press. p. 26. Retrieved April 5, 2017. ^ "São João Bosco". Don Bosco Sanctuary website (in Portuguese). Archived from the original on March 21, 2013. Retrieved March 8, 2013. ^ a b c d e f g Epstein, David (1973). Brasilia: Plan and Reality : a study of planned and spontaneous urban development. University of California Press. ISBN 0520022033. OCLC 691903. ^ a b c d e Wong, Pia (October 1989). Planning and the Unplanned Reality: Brasilia (Master of City Planning, 1988). IURD Working paper series. 499. University of California, Berkeley, Institute of Urban & Regional Development. OCLC 21925988. ^ Deckker, Thomas (2016). "Brasília: Life Beyond Utopia". Architectural Design. 86 (3): 88–95. doi:10.1002/ad.2050. ISSN 1554-2769. Brasília was not, in fact, planned in any meaningful way. The Brazilian architect and planner Lúcio Costa’s entry for the design competition for the new city in 1956 was a series of sketches of ideal urban forms of communal apartment blocks loosely based on Le Corbusier’s Ville Radieuse of 1935, and ‘superblocks’ of single-family houses based on the North American Radburn layout (1929). He subsequently elaborated these into the Plano Piloto (Pilot Plan), and added the satellite city of Taguatinga. ^ el-Dahdah, Farès, ed. (2005). Lucio Costa: Brasilia’s superquadra. CASE. Prestel Verlag. ISBN 3791331574. OCLC 491822493. ^ Pessôa, José (Winter 2010). "Lúcio Costa and the Question of Monumentality in his Pilot Plan for Brasilia". docomomo Journal. 43, Brasilia 1960-2010. ISSN 1380-3204. ^ Denicke, Lars (2011). "Fifty years' progress in five : Brasilia—modernization, globalism, and the geopolitics of flight". In Hecht, Gabrielle. Entangled geographies : empire and technopolitics in the global Cold War. Cambridge, MA: MIT Press. pp. 185–208. ISBN 0262515784. OCLC 731854048. ^ Banerji, Robin (December 7, 2012). "Brasilia: Does it work as a city?" – via www.bbc.co.uk. ^ A cidade das duas estações Archived May 4, 2012, at the Wayback Machine (in Brazilian Portuguese). ^ a b c d e f "Normais Climatológicas Do Brasil 1981–2010" (in Portuguese). Instituto Nacional de Meteorologia. Retrieved 14 October 2018. ^ "Station Brasília" (in French). Meteo Climat. Retrieved 14 October 2018. ^ "Population of Brasília". Geocities.com. January 17, 2007. Archived from the original on October 26, 2009. Retrieved April 17, 2010. ^ "Immigration to Brasília". Aboutbrasilia.com. Retrieved April 17, 2010. ^ "Religion in Brasília by IBGE". Sidra.ibge.gov.br. Retrieved October 11, 2012. ^ "Constituição da República Federativa do Brasil de 1988 - Título III, Capítulo V: Do Distrito Federal e dos Territórios" (in Portuguese). Governo do Brasil. 1988. Retrieved 4 August 2013. ^ "Prefeitos". A História de Brasília (in Portuguese). Info Brasília. Archived from the original on 12 April 2010. Retrieved 17 April 2010. ^ "Por que Brasília não tem prefeito?" (in Portuguese). Portal Terra. 25 August 2010. Retrieved 4 August 2013. ^ "Sobre a Câmara Legislativa" (in Portuguese). Câmara Legislativa do Distrito Federal. Retrieved 4 August 2013. ^ a b c d e f g h i j k l m n o "Brasilia Global Partners". Internacional.df.gov.br. Archived from the original on February 28, 2014. Retrieved February 25, 2014. ^ "Lisboa - Geminações de Cidades e Vilas" [Lisbon - Twinning of Cities and Towns]. Associação Nacional de Municípios Portugueses [National Association of Portuguese Municipalities] (in Portuguese). Retrieved August 23, 2013. ^ Martin Austermuhle (March 15, 2012). "D.C., Welcome Your Newest Sister City: Brasília". Dcist.com. Archived from the original on March 18, 2013. Retrieved March 18, 2013. ^ "GDP – Division – Federal District". Gdf.df.gov.br. Archived from the original on December 2, 2009. Retrieved April 17, 2010. ^ a b "Comparing Brazilian states with countries". Economist.com. September 5, 2011. Retrieved February 25, 2014. ^ "Culture in Brasília". Travelbite.co.uk. August 9, 2006. Archived from the original on December 20, 2011. Retrieved April 17, 2010. ^ "Dom Bosco – Brasília". Infobrasilia.com.br. April 21, 1965. Archived from the original on April 12, 2010. Retrieved April 17, 2010. ^ "Dom Bosco – Brasília". Flickr.com. March 24, 2009. Retrieved April 17, 2010. ^ Natália Castro (December 8, 2014). "Maria Fernanda Cândido e Enrique Diaz gravam com Fernando Meirelles nova série da Globo, em Brasilia". O Globo. Revista da TV. Retrieved December 22, 2014. ^ a b c "Brasília - Britannica". ^ "Esplanada dos Ministérios - map - Brasilia". www.aboutbrasilia.com. ^ "Brasilia International Airport – facts". Aboutbrasilia.com. January 4, 2007. Retrieved April 17, 2010. ^ "Bridge Awards". Eswp.com. Archived from the original on July 17, 2012. Retrieved May 5, 2009. ^ "Brasília Metro". Metro.df.gov.br. Retrieved February 25, 2014. ^ Fábio Amato Do G1, em Brasília (June 28, 2012). "G1 - Estudo vai apontar viabilidade de trem entre Brasília, Anápolis e Goiânia - notícias em Distrito Federal". G1.globo.com. Retrieved March 12, 2013. ^ "Brasília Public Transportation Statistics". Global Public Transit Index by Moovit. Retrieved June 19, 2017. Material was copied from this source, which is available under a Creative Commons Attribution 4.0 International License. ^ "Brasilia National Stadium". Government of Brazil. Archived from the original on September 5, 2012. Retrieved March 18, 2013. This page was last edited on 19 April 2019, at 02:49 (UTC).